You may have seen the write-ups in PC Gamer (Game of the Year runner up to MS Flight Simulator; they had no guns or cows; I suspect Mr. Gates used his vast influence and wealth to knock us out of the top spot, but I’ve never been able to prove it), and several other online and paper game publications. Getting to that point of worldwide critical acclaim took a few years and a lot of time staring at a computer screen filled with hexadecimal codes. I need to step back a bit further too really get the details of this story. Today, I do get to joke about being a rocket scientist. I do hold an aerospace engineering degree and I do work on instruments related to missile guidance. Therefore rocket scientist. I have been into aviation and all things flying pretty much from birth. My father has worked for 50+ years designing aircraft and other things for the Air Forces and I lived a stone’s throw or two from Wright-Patterson AFB growing up. By default you pretty much pick up on aircraft in that environment. I loved aircraft, warbirds especially. The older the warbird the better. I cut my WWI gaming teeth on Avalon Hill’s Richthofen’s War. 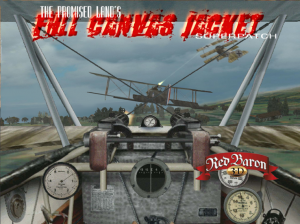 Then Fight in the Skies followed by Dawn Patrol. I loved playing those games. 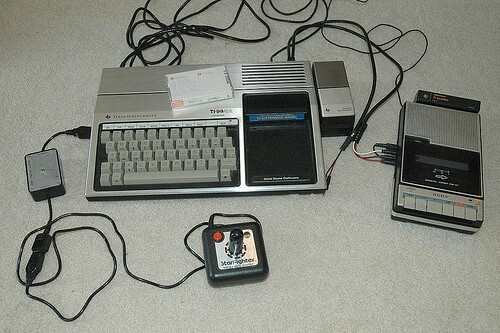 I also got hooked with computers, back in those heady days of the first home computers like the Ti-99-4A and Commodore 64. If you had a C64 back in the day you probably knew someone who had a second cousin who once talked to a guy whose brother was set up in a basement with linked 1541 floppy drives making copies of cracked software. That was not me. Really. I was the guy who used those hex editing tools and my growing knowledge of programming to start to dissect games and understand how they worked and, in an ever growing fashion, how to edit them. What all the hip kids call “modding” these days. If I bought a game, any game, I played it once or twice and then jumped in looking at the various files and data that made the game run. 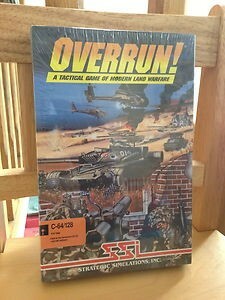 I don’t think there was an SSI wargame I owned that I didn’t have a modified version or two of sitting around with new units or adjusted stats. The same could be said for a number of other titles. 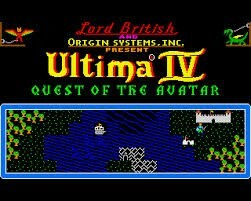 In particular, Ultima 4. I did a conversion of the C64 version called Quest of the Amazon. The map was changed, characters, text, items, and such. The funny side note to this little story was how years later my best friend got to talking with someone while on a business trip out west. He got on the subject of old games and this guy mentioned playing some hacked version of Ultima 4 called Quest of the Amazon. It was quite cool to have the game travel a good distance by getting passed along by some folks at college and then after leaving school. Such a small world. The original XCOM game was a big one for modding. I did a few editors for dealing with certain data values and by this time other folks were making tools too. Modding was beginning to take off. 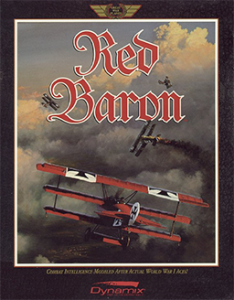 The path to Red Baron started with the first Red Baron game from Dynamix. I put together two different editors for changing the colors on the planes. 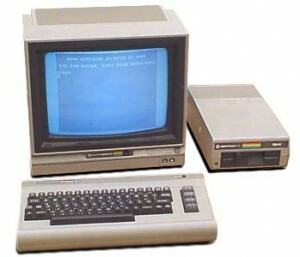 These were the first editors I made that got out into the wild via the BBS boards of the time. Think internet, but painfully slow, text based, over the phone modem sites. It was a herald for the future though. There is something very cool about modding and dissecting a game. You end up being part engineer, detective, programmer, archeologist, and madman. The madman factor is a key ingredient. Spending hours and days digging through hex codes making small changes and looking for the effects is not a job for the sane or rational mind. As the games got bigger in size and scope, the amount of data grew as well. 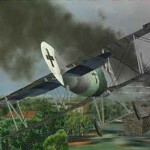 It was at this point back in ‘97 that Red Baron 2 was released. Being a Dynamix game and a WWI title I grabbed it right off the shelf. The game was patched and rebranded in 98 as Red Baron 3d. This is where the Full Canvas Jacket part of the story really starts. After playing the game for a while, I started my customary tinkering with files and also started looking around on this new internet thing for others playing and modding the game. 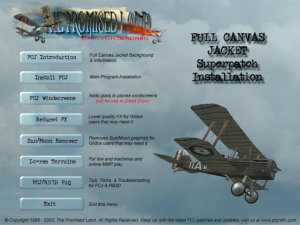 This led me to the Society of WWI Sim Artisans. SWISSA for short. It did not take long for me to get in the swing of things with the game. 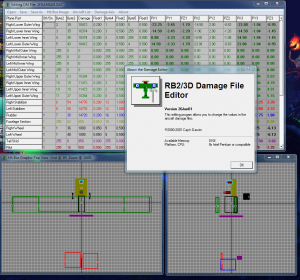 I first worked on a full damage model editor after a couple guys started looking into it, but I didn’t have great success with results. 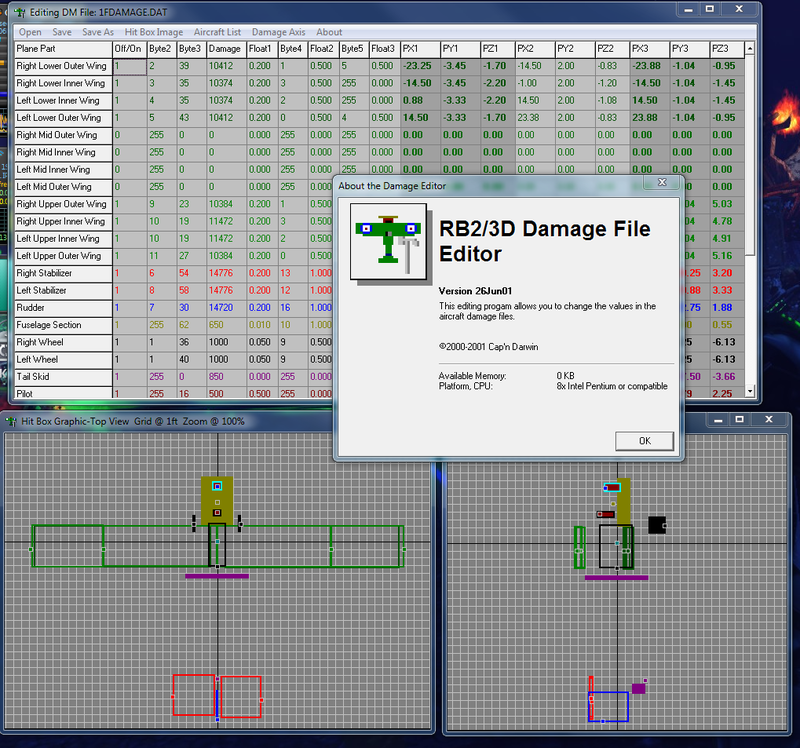 Once I had it figured out I built two versions of the damage editor and also reworked some aircraft damage files. One plus to this early effort was having a great bunch of folks at SWWISA to work with. People traded information and ideas freely because they wanted a better game. That made it easy to freely distribute all of the tools I created during the years of dealing with both Red Baron and Full Canvas Jacket. Below – A shot of the 2001 version of the Damage File Editor versus the one for Full Canvas Jacket in 2004. You can see the advances in layout and information gained in the intervening three years. 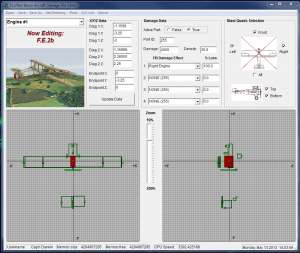 From there I worked with a modding group called the Fairy Godmothers of Flight on getting a Flight Model editor up and running based on their very hard work. 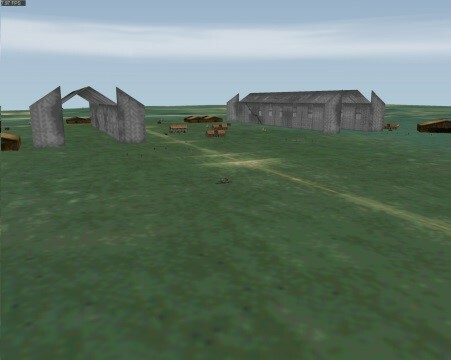 I was also expanding into other areas of the data and soon had editors for about a dozen different game related functions including damage, flight model, aircraft specs, object editors, terrain layout, graphics setting, color palette swapping and more. 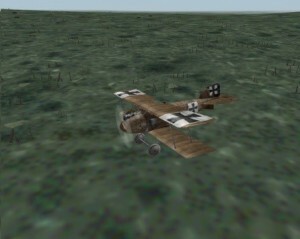 One other new weapon in the Red Baron editing front went largely unnoticed at first; the addition of a new 3d object into the game world. That rapidly launched me in a new direction of understanding all of the files associated with objects in the game and how those items were placed, described, and used in the game world. 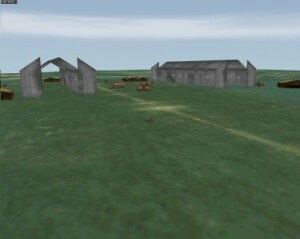 It was now possible to add, subtract, move, and rotate existing ground objects or add in new content. This was the Golden Age of Red Baron Modding. A number of talented folks brought other capabilities to the table. A number of folks made new aircraft from scratch, others did campaign and date based file swapping and a handful of artist did new skins for aircraft and other game items. There were also a couple of landmark additions to the SWWISA tools arsenal during this boom. The first was getting a couple of actual tools from what was now ex-Dynamix folks. These couple of tools helped process colors and textures for objects into the games file types. The other was one modder who found the Holy Grail by unpacking the game’s compressed storage files. Without that one achievement, a number of projects to follow, including my own and Full Canvas Jacket, would have been a fraction of what they became. As the Golden Age explosion was happening one of those very talented artists was chatting on and off with me on the SWWISA forums. We were both aware of what things we were doing in the game. One day Kess hit me up and asked if I wanted to take some of the stuff I was doing and add it to his effort. He was already doing a number of graphics related mods for the game and this time he was going after all the art and looking to replace everything with photo-realistic graphics. As realistic as the game engine would allow. But it was a night and day difference in the look of the game. On my end I was now taking everything I had learned and created and actually making it work on a large scale. I was adding in new objects with Kess’s new artwork. I was making new landscape files to add to all of the originals that I modified with new objects and more objects. 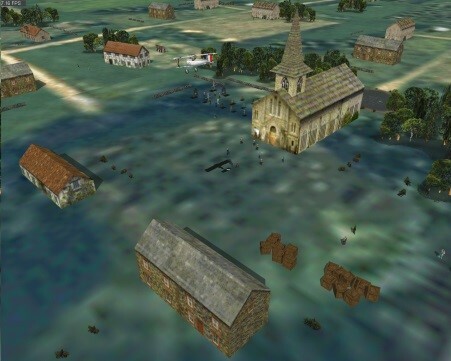 I would say we doubled the number of available objects by adding things like livestock, trees, shrubs, townsfolk, troops, cannons, ponds, buildings, trains and train cars, shattered trees and craters in no-man’s land, windmills, and zeppelin sheds to name a few. I would guess we roughly added about a tenfold increase in total world objects. All with damage art and all of them added into the object encyclopedia in the game. It was a massive undertaking and a not so healthly number of 23 hour days near the release date to get it all working. Did I mention this was on top of a day job and a new baby? Remember I did say you had to be part madman? I was. Now those long hours do lead to some humorous moments and little Easter eggs in the game. When you are doing this day in and day out for months you do get a little punchy at times. There are a couple Easter egg type items in the Full Canvas Jacket game. Undoubtedly brought on from sleep deprivation. One person found and posted about one of them. It was a lone cow on the railroad tracks near a bridge. Simple, but funny. Another was never located, but I placed a number of cows in and around some tree clumps around Marne. Probably enemy spy cows; they’re shifty like that. Another game induced funny moment came with the addition of the pond placed behind the church in a number of the cities. I flew from a nearby airfield to review the work. This was something I did often to check frame rates and to make sure everything had the right textures. Well, I’m tooling along getting closer to the center of the city and all of a sudden I’m getting peppered by light anti-aircraft artillery. I’m perplexed since I’m over friendly territory, but the angry puffs around my crate say something is amiss. I start looking around for the source and I catch a puff of smoke coming off the center of the pond. Sure enough, the fire is coming from the pond itself. “The ducks are packing heat!” I yelled. This brought my wife running into my office figuring I had finally snapped under the pressure. I hadn’t. It was a side effect of the object type code the new pond object was made under having a hard coded behavior of AAA. We almost left that in the game too! The last piece of the Full Canvas Jacket puzzle was building the front-end control panel. I had already made a few programs to tweak a number of graphics and game play related settings before getting into this project. Kess wanted a front end with splash screen, about box, settings, music and then a game launch button. It was a slick little program and did all those things and was pretty much ready for prime time a few weeks ahead of the release date. Then I got a package in the mail from a mysterious benefactor. Maybe Batman or a SHIELD agent. In the package was a plain looking CD. On the front it said “RB Source Code”. I nearly fainted. A bunch of C files and headers. It was Christmas all over again. I tore into it looking for a number of specific files and setups in order to verify the meanings of dozens of variables we all had been using and assuming for years. Thankfully, we were right on a vast majority of those functions. Well I was able in those last couple weeks to fully revamp the control panel and use a number of corrected and brand spanking new values as well. Some of these new tweaks required altering values in the executable as well. It was worth it. You could set every in-game option, all of the new options and all of the tweaks from the old programs from one place then launch the game. It was sweet. Kess released the super patch, as it was called, while I was out of town on vacation. It was cool to look online and see all of the very positive reviews come in from all over the world. The internet did make the world smaller after all. Then we had glowing reviews from the game magazines and simulation websites. And, as mentioned before, ended up as runner up for flight sim of the year (GAAATTTEEEESSS!!!). High praise for a mod to a five plus year old title. It was a lot of work, hours, and sweat, but well worth it looking back. I hope this was somewhat enlightening and perhaps entertaining to read. Modding has come a very long way over the years and now it is very common place for game to have support for modders out of the box. I’ve been lucky to have started on the ground floor in this area and still mod games and tear them apart today. Like I said earlier, I’m a bit of a madman. …i’ve been trying to get this gem for years, no success, they’re selling RB 3D at Gog.com ,so why isn’t FCJP offered there,too ?